Elaborating further, Abbas claimed that Olmert at the time asked for territorial exchanges amounting to 6% of Judea and Samaria while the Palestinians wouldn’t go beyond 1.9%. According to another PA daily, Al-Quds, Abbas asserted that the current American-sponsored negotiations revolve around fixing borders and that “the Palestinian position is based on the understandings reached with Olmert. However, the Israelis now want to scrap the understandings reached on borders with Olmert.” He threatened to resume unilateral initiatives at the UN. And, not to forget, numerous PA mouthpieces insist that the phased release of 104 convicted murderers (which Abbas secured for his consent to at all parley) must continue no matter how negotiations turn out. And there’s more: the PA now wants 250 others sprung. All this chatter led Jerusalem to lodge a stiff complaint with Washington over the incessant leaks from Palestinian interlocutors. The talks were launched under the understanding that nothing would be divulged about what was being deliberated – not even technical details – and that only the US could brief the media. 1. No past concession is ever fully relegated to the past – not even Olmert’s extremely egregious territorial generosity at the very end of his term. He went even further in his offers than Ehud Barak did in 2000. Yet Olmert’s extreme largesse too was brusquely rebuffed. Nothing was agreed to and nothing was finalized, much less signed. All that doesn’t prevent Abbas from cheekily misrepresenting the rejected Olmert proposal as a done deal that obliges Israel and all its future governments. 2. No concession ever suffices; it only whets the appetite for more – i.e. the aim to force Israel to release yet more convicted mass-murderers, regardless of whether the negotiations get anywhere. 3. It was naive to hope that negotiations and/or an interim deal can fend of more unilateral PA stunts at the UN and other international forums. This is now the whip with which to beat Israel into submission. 4. Territorial compromise is hardly doable. Abbas plainly aims for all or nothing – the 1949 armistice lines (a.k.a. the 1967 non-border) or nothing. 5. 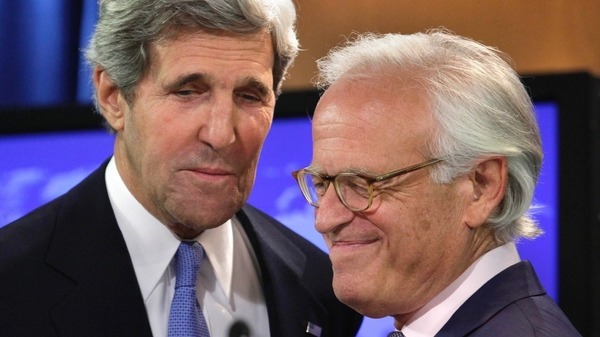 The very fact that US envoy Martin Indyk partakes in negotiating sessions in and of itself negates the principle of direct talks. It means that each side will appeal to him, that the US is an active player in the process, that Indyk is an adjudicator/mediator at best – which is bad enough. In reality, he can mix things up and impose so-called compromises. This – considering the dynamic that Israel always gives and the Palestinians merely have to deign to take – will perforce operate to Israel’s detriment. It’s a reality once well grasped by all Israeli leaders – on either side of the political divide. Hence historically their insistence on direct talks was nothing less than cardinal. A succession of foreign emissaries and politicos came and went but Israel consistently recoiled from the notion of shuttle diplomacy, go-betweens or overseers such as Indyk. At first this principle steadfastly guided even the misguided progenitors of the Oslo folly. But two decades of making one existentially risky concession after another existentially risky concession – of erasing one declaratively inedible red-line after another, drawing new ‘red lines” but deleting these in turn again – have eroded that underlying resolve. To be fair, Netanyahu inherited an unenviable legacy. The Osloites stealthily ushered another Arab Palestinian state into the original territory once designated as Palestine, some 80% of which is already Arab (even if it parades under the wholly artificial name of Jordan). Barak, in his catastrophic stint as premier, established the ever-insidious model of total Israeli withdrawal back to the 1949 green-tinted lines. Later Olmert shockingly reinforced the Barak precedent. This, coupled with Washington’s most antagonistic administration ever, left Netanyahu in dire circumstances and with powerful incentives to just please the hectoring censorious chorus out there. Giving in is the easy thing to do. But, if past experience has taught us any lesson, it’s that buying time via “painful concessions” doesn’t work. Concessions become self-evidently the new square-one for ensuing haggling rounds. History suffers no vacuums. Every retreat spawns yet another retreat, triggering a negative dynamic. Oslo elicited universal acceptance of a third state in original Palestine (the second Arab one), which forced Israel into increasingly defensive negotiating postures, culminating in Barak’s capitulation. Ariel Sharon subsequently expelled Jews and razed 25 veteran thriving settlements. Then, on paper, Olmert ceded most remaining settlements. The security fence was essentially moved to 1949’s Green-Line. Next (and this, significantly under Netanyahu) Israel temporarily froze Jewish construction in Judea and Samaria, thereby implying that it somehow concedes that the settlements are illegitimate. But even that failed to satisfy. Each concession breeds another and thus Jerusalem was targeted and Jewish residence came under fire in a city which boasted a very massive Jewish majority already since the first census was taken there early in the Nineteenth Century. Bargaining, which we assumed would be about agreed boundaries within the territories we were forced to take in the course of our self-defense in 1967, turned out to be about the 1949 line of exhaustion demarcated to end of the War of Independence imposed on us. Beyond that lies an older Arab claim for the 1947 UN partition lines which Arabs rejected violently, thereby sparking that War of Independence. And raging ferociously before that was the antebellum debate about whether any Jewish state ought to exist, which is what fueled that violent Arab opposition in 1947. The same animus still foments Arab refusal to recognize Israel as a Jewish state or to forgo the “right” to inundate that Jewish state with untold millions of hostile Arabs who’ll destroy its continued existence as a Jewish state. While Israel serially drew back from its positions in order to appease America and/or to coax Arabs into some modicum of accommodation, Arab orientations during all that time hadn’t budged a fraction of a millimeter. Their only modifications were tactical. Instead of eradicating Israel in one fell swoop (which they didn’t do only because they couldn’t), they settled on slicing Israel’s salami bit by bit to deprive it of strategic depth, render it more vulnerable to predations and erode it by demonization and demoralization. The basic premise remains that at most the de facto existence of the unwanted “Zionist entity” is acknowledged provisionally, that this entity must shrink and that Arabs have a right to deluge it. That’s why it’s taken for granted internationally that Israel must be squeezed into the 1949 lines. Global discourse now dwells on whether there’s at all any justification for a Jewish state. We have indeed come a long way – backwards. By rushing recklessly headlong to resolve a conflict not of our making, we ended up returning to its very origins – the aspiration to eradicate the Jewish state. Have we anything to show for decades of regression? Not much if we judge by the revelations from Ramallah. Yet they are among the few things these days we can be thankful for. Look at the bright side Sarah, at least the “talks” provide a smokescreen that “progress” might be made at a certain undetermined point of time in the future, while stuffing a sock in the mouth of our American “friends” and letting them delude themselves even further. Those “peace” = SURRENDER talks are PURE madness…Does anyone in Israel really want to destroy the Jewish state ???!!! There is no bright side to the current negotiations. It is all darkness and gloom. Far brighter prospects for Israel are found only in the Bible. “For behold, darkness will cover the earth, and deep darkness the peoples; But the Lord will rise upon you, and His glory will appear upon you. Nations will come to your light, and kings to the brightness of your rising” (Isa. 60:2,3). Fear not, the mounting evil that threatens to overwhelm Israel is only being allowed by God to flourish in order “that they might be destroyed for evermore” (Psalm 92:7). Dear Sarah, your latest tack was right on target as ALWAYS ! The arabs could have had a nation in 1948. They rejected it. “A shrewd conqueror will always enforce his exactions only by stages … The more numerous the extortions thus passively accepted, so much the less will resistance appear justified in the eyes of the people, if the vanquished nation should end by revolting against the last act of oppression in a long series. And that is especially so if the nation has already patiently and silently accepted impositions which were much more exacting.” A quote without reason from the author of the 1925 bestseller Mein Kampf. Very good quote. It’s something everybody should know, but few do. I am referring to the concepts in the quote. That’s how evil advances, and it doesn’t even need to hide it. People hide it from themselves like the proverbial ostrich, and they get indignant when it’s pointed out to them. I feel compelled to add though, a twist. What is even more Machiavellian? I quote from a Leonard Cohen song: “Into this furnace I ask you now to enter…”. And with the desire to see Israel reduced in size by reversing history to.pre.independence, what is the sense of allowing appeasers such as Livni to be involved in the negotiations? Surely we compromise our position, since there is no recognition of Israel by the opposition and no desire to see its continued existence, – by allowing “kumbayaists” to represent Israel? If the West Bank becomes a Palestinian state, what happens to the 330,000 Jews who live there? Are they to be given eviction notices and forced to move to the other side of the Green line? Unacceptable. Recognize Israel’s right to exist, as a Jewish state. Otherwise, no peace talks. No matter what. I thought Menachem Begin did that when he evacuated Yamit. A country 1 million miles wide is demanding that Israel settle for a a nine to 15 mile width. And Israel’s leaders say amen. A ship of fools.